Debby Kratovil was Special Projects Editor with QUILT Magazine for 15 years, with over 600 articles published. In 2006 alone, she saw 54 of her quilts published, with another dozen sewn for major fabric companies. She has seen 25 of her quilts make the cover of quilting magazines, with 9 covers in 2006 alone. As she says, "I sew for the camera, making sure my quilts are very photogenic." She is a popular teacher both locally and nationally, as many happy students will attest. Debby authored "Bold, Black & Beautiful Quilts" (AQS, 2004), 10 quilting calendars for Accord/Andrews McMeel Publishing (2006 - 2014), a perpetual Quilter's Block-a-Day Calendar and companion CD by Martingale. Her second book, Supersize "Em Quilts, is filled with 22 projects to appeal to any quilter's discriminating taste. 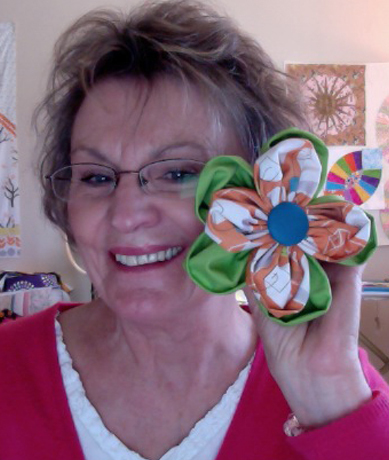 Debby is a prolific quilter, designer, and illustrator. Her most recent book, "Perfect Paper Pieced Points" is a wonderful treasure trove of eye-popping color and design. Best of all, she enjoys every minute of it. Currently she designs and sews quilts for 3 fabric companies and her quilts appear in a variety of magazines. She loves to travel and teach and working for the Original Sewing and Quilt Expo takes her to a dozen cities a year. Debby takes her wide range of quilting skills from a pile of fabric to a finished quilt, then to creating the patterns and professional illustrations print-ready. Debby likes to say, "I've never met a fabric I didn't like." One of her special talents is making a beautiful quilt using challenging fabric collections. She is on very good terms with her computer and computerized sewing machines, which enables her to take a project from start to finish quickly. Debby lives in Fairfax, Virginia with her husband Phil and dog Belle. She has 3 grown daughters and 3 awesome grandchildren!